When you take a moment and travel back in time within the realm of baby names and compare your findings to today's data, you'll see that boy names don't change nearly as much as girl names do. Males have certain evergreen names that seem to always be in use. Many of them happen to be biblical which is the most obvious reason for their consistency but it is a different story for females. The most evergreen name for girls is Elizabeth. Biblical, classic, versatile. Sure there are a few others. Mary had a record breaking reign unlike any other name, but for the most part, girl names swing in and out of fashion frequently. Some names that were popular even ten years ago are already losing steam. Is it any different for names of the 1880s? Are they still out or are many of them back in now? A bit of both. While many of the more fashionable grandma names are increasingly being labeled as vintage and are rapidly climbing the charts, many of their stuffy counterparts are still hibernating. Will they arise again in future generations or remain dusty? Let's ponder that. While looking at the Top 200 Names of the 1880s via the Social Security Administration's data, I handpicked 10 names that do not currently rank within the Top 1000 but deserve greater usage. Comparing the 1880s full-decade data vs today's hot names, there is quite a long list of names that are still not being viewed as fashionable. The question is, could they be revived in a decade or two? After all, that 100-year rule is proving to be tried and true for many names. Keep in mind, we will need to skip over the evergreen names that are still ranking well in 2014. We aren't interested in those right now. We want to find the names that have fallen from favor, names like Bessie or Myrtle that were once well-used and evaluate their chances of modern use. Sticking to the collective data from the entire decade, we will take a closer look at 10 of those names within the 1880's Top 200. 1. Florence #12 - Florence was the 12th most popular name for the combined decade of the 1880s. After that, it skyrocketed up the charts even more, landing at #14 in the year 1918 with over 11k births. That was her peak though. Florence fell as fast as she rose. In 2014, there were only 182 births (and that was up from her lowest point of 54 births in 2009). Florence is starting to lose her fustiness, though, could she climb back up the charts? 2. Maude #25 - Maude was most popular in 1888 with 1,396 births on record. She lost some popularity after that until there was another slight boost in 1915. Beyond that, Maude became rare. In 2014, only 15 girls received the name. Maud is even rarer. Should Maude remain down or does she deserve more usage? 3. Louise #38 - There's no direct proof, but Louise seems to be used more as a middle name these days. Louise was most popular in 1918 and declined in usage after that. Only 199 girls received the name in 2014. It's almost surprising that Louise hasn't ranked within the Top 1000 since 1991. However, for the first time since 1969, sister-name Louisa did rank. Could Louise be right behind her? 4. Agnes #51 - The woman in our photo above wore this name. Agnes Moorehead was an actress known for her role as Endora on the television series Bewitched. As for her name, Agnes is another one of those old-fashioned names that peaked around 1918 and then declined again. It has been outside the Top 1000 since 1973 but it is recently starting to tick upward a bit. 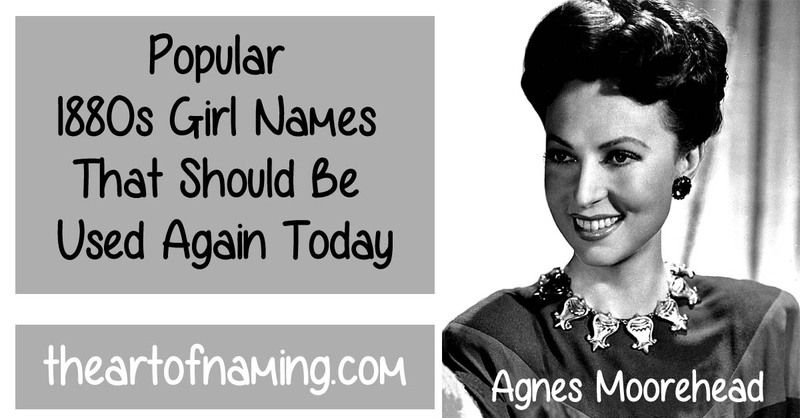 In 2014, there were 187 girls named Agnes. 5. Harriet #90 - Like many of the other top names from the 1880s, Harriet was even bigger around 1920 and then fell off the charts. Also like those other names we've mentioned, Harriet is slightly ticking upward. After a few decades flying under the radar, Harriet is up to 127 births in 2014. It currently ranks well in England/Wales. Will it ever rejoin the Top 1000 in the US? 6. Mildred #102 - At the end of the 1880s, Mildred started gaining more usage and then exploded in popularity just before and just after 1920, ranking as high as #6 with over 18k births. But just as quickly as she climbed the charts, she descended right back down. So far, Mildred hasn't shown any signs of revival, holding a steady 70-90 births per year since 1993 (with 82 in 2014.) Could Mildred make a comeback in light of names like Millie climbing the charts? 7. Pauline #109 - Pauline peaked in 1918 with over 7k births for the year. After that, it gradually lost its popularity, falling out of the Top 1000 in 1998. As of 2014, there were only 66 girls named Pauline. Since actor Vin Diesel recently used it as an honor name and put a spotlight on it in Hollywood, could Pauline gain a little boost of popularity or is it not quite enough to revive it? 8. Augusta #117 - Augusta ranked well in 1890 and even better in 1915 but this name lost its favor soon after that, falling out of the Top 1000 by 1945. Only 49 girls were named Augusta in 2014. This name really deserves more usage for girls, especially since August, Augustus and Augustine are ranking so well for boys. Could Augusta come back? 9. Luella #155 - Luella's popularity peak was in the year 1918 with 949 births. It ranked in the 100-300 range for many years but began declining in the 1940s, dropping out of the Top 1000 in 1956. It fell as low as a mere 6 births per year in the early 90s, but currently, Luella is slightly ticking upward with 145 births in 2014. With similar L-l names ranking well like Lila and Lola, could Luella make a come back? 10. Winifred #161 - Winifred has been in use for girls since the 1880s but it was also occasionally given to boys from the early 1900s through the 1970s. For girls, Winifred's biggest year was 1918 when 1,593 girls were named. It hit a low point of 12 births in 1994 but it is currently back up to 99 births for 2014. What do you think of Winifred? Does the 'fred' part throw off its appeal? Could it ever be revived for a modern girl or is better for a boy? Which of these 10 names do you think stands the best chance of revival? What do you think of these names? Would you use any of these? If so, which ones? Which are realistically the best options for a modern girl?